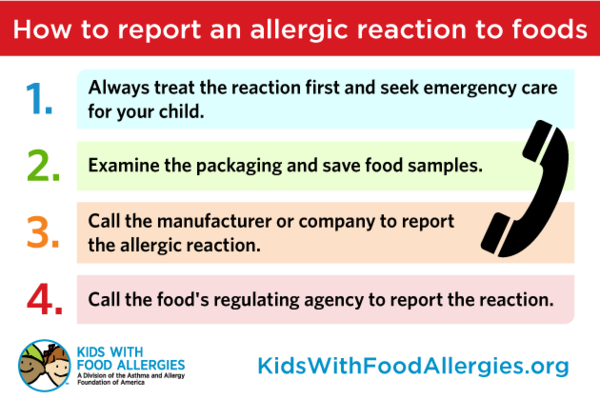 If you suspect your child had an allergic reaction to a mislabeled food, you can report it. By doing so, you can help play an important role in public health. 1. Always treat the reaction first and seek emergency care for your child. If your child already has a food allergy, follow the emergency action plan given to you by your child’s allergist. Remember to take all allergic symptoms seriously. Both mild and severe symptoms can lead to a serious allergic reaction called anaphylaxis. After you have received emergency care, follow up with your doctor. He or she may want to see if your child has developed a new food allergy. 2. Examine the packaging and save food samples. Reread the entire packaging or label that you saved, including voluntary "may contain" statements. Does it list an ingredient your child is allergic to, or does the label not list it? Note the size, brand name, product name and manufacturer. Try to remember where and when you bought the product. Also, write down everything else your child ate at the meal when the problem occurred. This will help rule out any other possible sources of the reaction. If you can, save enough samples for testing by both the company and the regulatory agency. Put them in the refrigerator or freezer. 3. Call the manufacturer or company to report the allergic reaction. Manufacturers may start their own investigation (and possible recall) before the regulatory agency gets involved. 4. Call the food's regulating agency to report the reaction. The Food and Drug Administration (FDA) regulates manufactured food products. For FDA products, keep package codes and expiration dates. Call the FDA consumer complaint coordinator for your area. The U.S. Department of Agriculture (USDA) Food and Inspection Service regulates meat, poultry, processed egg products and certain foods that contain these products. For these foods, look for the establishment number (EST). 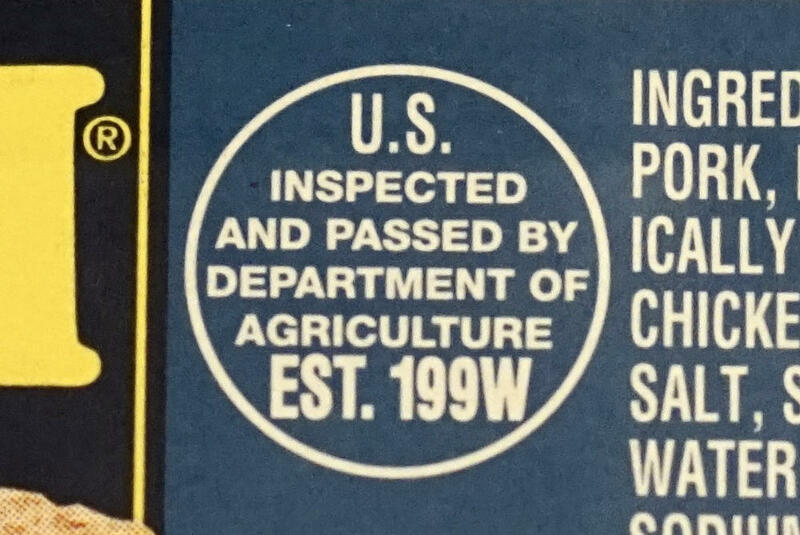 The EST number is usually found in the circle or shield near the "USDA passed and inspected" phrase. Report the issue to the USDA. Call the toll-free USDA Meat and Poultry Hotline at 1-888-MPHotline (1-888-674-6854) or report the complaint online. Give the investigator all the information you collected and follow any other instructions. Your report may lead to a voluntary recall or withdrawal of products from the marketplace. If you don't get an answer by contacting the manufacturer and/or the regulating agency, you can contact the University of Nebraska Food Allergy Research and Resource Program. They may be able to analyze the food sample. Find more information about Choosing Safe Foods: How to Read Labels So You Can Avoid Food Allergens. If your child has had a severe allergic reaction, we offer support in our "After Epinephrine" topic in our Anaphylaxis Support forum. Joining our support community is free. Ouch on the reaction, and good to know. It's also good to know there's a process in place for how to report foods that are mislabeled. Leslie, has your son ever had a reaction to a food that wasn't properly labeled? He had a reaction to a cereal made by Van's that was labeled as safe for him, but I think it was a cross-contamination issue instead of a mislabeling. If he had a reaction to a mislabeled food, I don't think that it would occur to me to have the food tested. When he reacted to the cereal, I called and there was a cross-contamination risk for tree nuts that was not labeled, so I don't buy their products anymore.